I don't read Jersey Jazzman's blog as often as I should. He's got very sharp analysis of all things Jersey, and often goes beyond. He's gone in depth over the massive failures of merit pay, and the fact that politicians continue to believe in it, rely on it, and impose it despite a 100-year history of abject failure. His most recent blog is on Chris Christie's public criticism of a system he himself negotiated and passed. This is, in fact, exactly what Andrew Cuomo did, before revamping it to make it even worse. In New Jersey, there is a case of a teacher who was late 111 times over a two-year period. His case was brought to an arbitrator, and the teacher wasn't fired. Now I'll go on record, as did JJ, to say that if you're supposed to be in at a certain time, or course you should be in at that time. And I'll also agree that 111 latenesses over two years is pretty outrageous. That's why it's got such attention-grabbing potential on Twitter. Wow, those teachers can get away with anything, huh? It's awful. Who needs any further detail before we pass judgment? Does it matter that most of the latenesses were only two minutes, or that he had to actually stand on a line to clock in every morning? What if, as I read in an ensuing interview, he never missed a moment of class? Does it matter that he was, in fact, rather severely penalized? He will be on unpaid leave until January. Could you afford to be without income or medical benefits for half a year? In any case, as JJ points out, it was the arbitrator's call. 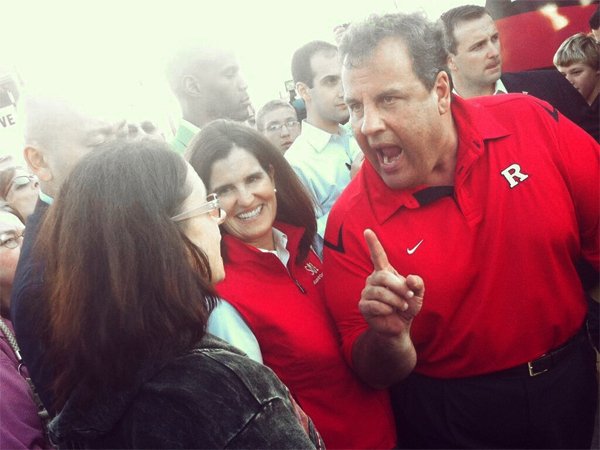 As sad as it is, Christie sometimes has to follow the rules he helps make. I mean, it's tough to do that, just like it's tough to have to pay the state portion of the pension. After all, wouldn't that money be better used in the form of tax breaks for Christie's wealthy BFFs? But I digress. The thing that I found most egregious about the clarion calls against tenure was that it took one flashy case, and painted all of us with it. For example, I was not late 111 times over the last two years, yet my tenure is being condemned on the basis of one person who was. That, dear readers, is what is known as a stereotype. For example, I'm kind of upset with Iowans this week, as they have an undue influence on who becomes President. If I find one Iowan drunk on the street, shall I condemn them all as a bunch of drunks? If one of them is cheap, or dumb, or promiscuous, or crazy, shall I do the same? That particular paintbrush is indispensable in the bigot's tool kit. I won't rehash ethnic stereotypes, but they're all based on the same old thing. I grew up with stereotypes. I didn't much like them when I was a kid, but I understand them a lot better now. My job entails dealing with kids from every corner of the earth. Few things upset me as much as one kid refusing to cooperate with another, because she comes from here or there, because she's this or that religion or color, because her accent is harder to understand than yours, or whatever. I tell the kids someone hates each and every one of us in this room just because of who we are. I have patience for children. Bigotry has considerably less charm when it comes from adults. Adults are supposed to know better. I'm sorry, Chris Christie, that when you make agreements even you have to follow them. I realize how inconvenient that is. But I won't label all governors juvenile crybabies simply because it applies to you and Governor Cuomo. Because that would be a stereotype, and stereotypes are the refuge of the small-minded. It's pathetic when politicians have to resort to such nonsense. You'd think, by 2015, we'd be past that. Sadly we're far from it.